If you’re the type of person who yells at the TV, then ABC has the perfect iPad app for you. 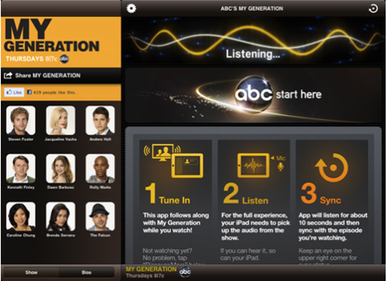 My Generation is a show debuting on ABC on September 23 and, in an industry first, the My Generation Sync iPad app is designed to be used while you watch the show. Your iPad’s microphone figures out what part of the show you’re watching, and synchronizes the interactive content you receive on the iPad alongside the show. Regardless of whether you’re watching at the time of broadcast or later via your DVR, you’ll see iPad content that tracks your viewing experience in real time. There’s a demo video that shows you what you can expect: quizzes, background information, and the like. There’s no sign of any sort of online forum with other viewers (an obvious thing to have, in my opinion), but if you’re watching My Generation by yourself on a couch, like the attractive model in the demo, you can use the app to pretend you have a social life. Snark aside: from a technical perspective, I think the idea of syncing television to apps through ambient audio is brilliant, and I can only imagine how popular this app would have been if it had been available for cult shows like Battlestar Galactica or Lost. I’ll be interested in seeing whether ABC rolls it out for other shows, or if the technology pops up for other networks. My Generation Sync app requires an iPad running iOS 3.2 or later, and is a free download. You’ll probably also want a television—or another iPad running Hulu Plus.